Coolstructures's Insulated Metal Panels (Metal SIPs) with highly insulating polystyrene cores dominate our line of Structural Insulated Panels, yet sometimes FRP laminates and/or mineral wool cores may be appropriate. These structurally insulated panels are incredibly strong and lightweight, and can reduce or even eliminate the need for an internal steel grid - making them preferable to metal building. Our Insulated Metal Panels give engineers, contractors and building owner's unmatched flexibility for a broad range of applications. 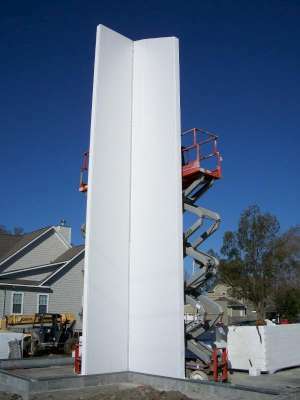 Coolstructures structural insulated panels for walls, floor, or roof construction utilize thermally efficient polystyrene rigid foam insulation cores laminated with an carbon steel, stainless steel, Galvalume®, or even FRP skins. 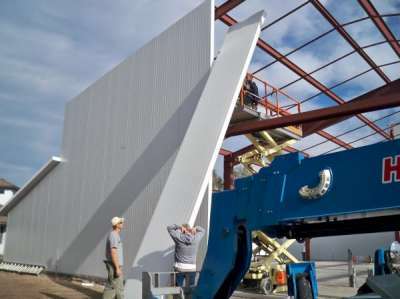 Coolstructures Insulated Metal Panels achieve superior structural integrity through a proprietary composite sandwich structure where the strength of rigid foam insulation is optimally complemented by the metal laminate. Whether used for wall or roof construction, an Coolstructures insulating panel system is superior to wood-based SIPs since our Metal SIPs are moisture resistance and weather-proof, even without additional siding or vapor barriers. Coolstructures's insulated metal panels are custom-engineered to meet the most demanding project requirements. These composite sandwich panels have exterior skins prefinished in an array of skin colors and textures, and fabricated with your choice of stainless steel, galvanized steel, standard steel, or FRP skins. Coolstructures's Architectural Insulated Panels offer additional specialty colors, textures, and sidings to meet particular aesthetic objectives. Nothing comes close to matching Coolstructures’s energy-saving properties, where required high R-values can be achieved EPS insulation cores. Mineral wool insulation is available for fire-resistant applications. Offered in a variety of thicknesses between 2 and 12 inches (5 to 31 cm), these structural insulated panels minimize thermal bridging and offer unsurpassed thermal efficiency, providing the lowest cost per “R”of any similar panel product. With Coolstructures panel systems you save $ today and tomorrow. Coolstructures's continuous laminating line can manufacture structural insulated panels in any desired length and to each jobs specific tolerance needs. Coolstructures’s panels for walls, roofs, or floors are a snap to install, using a simple "tongue-and-groove" with a spline design that reduces thermal bridging (heat loss) - - often so prevalent in more complex designs. Coolstructures SIPs panels simply slide into place and are easily secured to the building’s steel superstructure. In fact, Coolstructures Insulated Panels are so strong and secure; they enhance the strength and rigidity of the structure.